It was a “Jekyll and Hyde” week for the Cubs, as they stumbled a bit Tuesday, Jan. 22, and were mildly upset, 86-81, by St. John’s Prep. Then Thursday, the Kimball boys came out of a short-lived hibernation and defeated a very tough Pierz Pioneers team, 58-53. (SJP Game) Kimball Stats: Chase Gustafson, 3 points, 4 assists; Jack Knaus, 5 points; Thomas Pearson, 17 points, 5 rebounds; Drew Gustafson, 20 points, 10 rebounds, 13 assists, 4 steals; Noah Jurek, 29 points; Riley Miller, 7 points. The Johnnies started out great, hitting (9) three pointers in the first half. Unfortunately, the Cubs were not effective in their half-court defense and did not contest wide-open shots. In the second half, Kimball increased the defensive pressure and forced some turnovers, which led to some easy buckets for the Cubs. “There were two different times we took a three-point lead in the second half. However, we could not maintain the lead and came up a little short. This was a very tough loss to a one-win team,” said Coach Jay Klein. (Pierz Game) Kimball Stats: Chase Gustafson, 3 points, 4 assists; Thomas Pearson, 18 points, 7 rebounds; Drew Gustafson, 11 points, 6 assists, 4 steals; Noah Jurek, 20 points; Riley Miller, 4 points, 5 rebounds; Brian Binsfeld, 2 points. “We looked like a totally different team tonight, exhibiting great energy from the bench and on the floor. Our defense played with a lot of intensity and we communicated well. Thomas Pearson really stepped up for us tonight; scoring the first eight points of the game and finishing with 18. Our struggles from the free-throw line continued (17/32), but at least we were attacking the basket instead of settling for perimeter jump shots. It was a great team effort tonight,” said an exuberant Coach Klein. 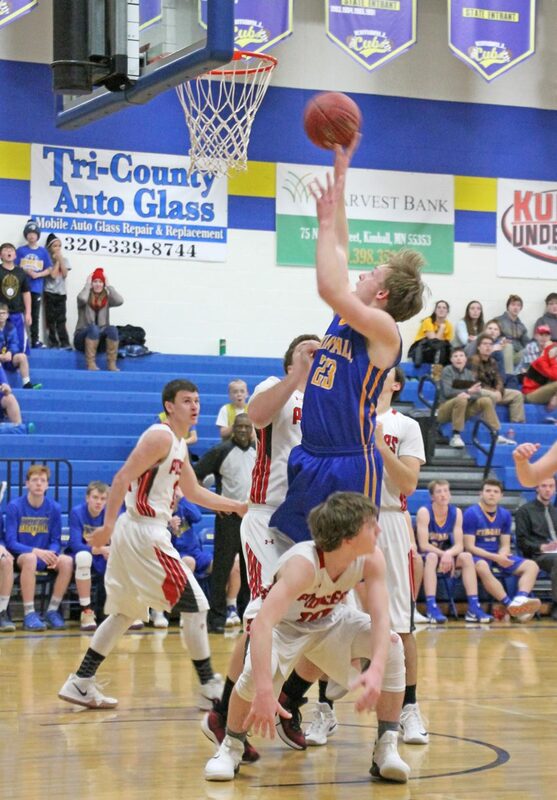 Thomas Pearson drives to the basket for two against Pierz. Pearson ended the night with 18 points. Riley Miller puts up two against Pierz to put Kimball back in the lead. Kimball bested Pierz 58-53. Photos courtesy of Amanda Garding.